GST on coated textile fabrics, coated textile articles, impregnated textile fabrics, impregnated textile articles, laminated textile fabrics, laminated textile articles etc. Coated, impregnated, laminated textile fabrics and textile articles falls under HSN code chapter 59 of GST commodity tariff schedule. The details about GST rate changes for sale of Coated, impregnated, laminated textile fabrics and textile articles are being updated here. 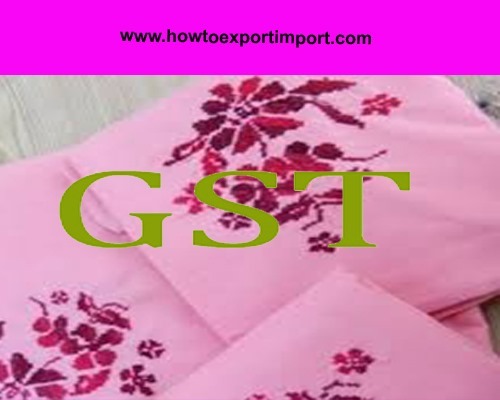 The notification changes on exemptions for GST for sale of Coated, impregnated, laminated textile fabrics and textile articles and other circulars related to GST for coated, impregnated, laminated textile fabrics, textile articles are updated in this website. 1. 5901 Textile fabrics coated with gum or amylaceous substances, of a kind used for the outer covers of books or the like; tracing cloth; prepared painting canvas; buckram and similar stiffened textile fabrics of a kind used for hat foundations. 2. 5902 Tyre cord fabric of high tenacity yarn of nylon or other polyamides, polyesters or viscose rayon. 3. 5903 Textile fabrics impregnated, coated, covered or laminated with plastics, other than those of heading 5902. 4. 5904 Linoleum, whether or not cut to shape; floor coverings consisting of a coating or covering applied on a textile backing, whether or not cut to shape. 5. 5905 Textile wall coverings. 6. 5906 Rubberised textile fabrics, other than those of heading 5902. 7. 5907 Textile fabrics otherwise impregnated, coated or covered; painted canvas being theatrical scenery, studio backcloths or the like. 8. 5908 Textile wicks, woven, plaited or knitted , for lamps, stoves, lighters, candles or the like; incandescent gas mantles and tubular knitted gas mantle fabric therefor, whether or not impregnated. 9. 5909 Textile hose piping and similar textile tubing, with or without lining, armour or accessories of other materials. 10. 5910 Transmission or conveyor belts or belting, of textile material, whether or not impregnated, coated, covered or laminated with plastics, or reinforced with metal or other material. 11. 5911 Textile products and articles, for technical uses, specified in Note 7 to this Chapter; such as Textile fabrics, felt and felt-lined woven fabrics, coated, covered or laminated with rubber, leather or other material, of a kind used for card clothing, and similar fabrics of a kind used for other technical purposes, including narrow fabrics made of velvet impregnated with rubber, for covering weaving spindles (weaving beams); Bolting cloth, whether or Not made up; Felt for cotton textile industries, woven; Woven textiles felt, whether or not impregnated or coated, of a kind commonly used in other machines, Cotton fabrics and articles used in machinery and plant, Jute fabrics and articles used in machinery or plant, Textile fabrics of metalised yarn of a kind commonly used in paper making or other machinery, Straining cloth of a kind used in oil presses or the like, including that of human hair, Paper maker's felt, woven, Gaskets, washers, polishing discs and other machinery parts of textile articles. In India, GST is payable for impregnated, coated, laminated textile fabrics, textile articles. However, some of the categories of business under HSN code 59 are expected to be exempted from paying GST. The list of exempted commodities and services under GST is expected to be released soon. Rate of GST slab on textile fabrics (not tire cord) coat, plastics etc. Tax of GST on lamps, gas mantles and textile wicks etc. GST expenses on coated, back-cloths, theatrical scenery, textile fabric, etc.